A very special event that brings the best of fforest together, a holiday full of creative engagement with the vibe of a festival. Two week long family friendly gatherings with emphasis on engagement, exchange and fun. The great outdoors, activity for mind, soul and body, creativity and simple pleasures have always been bound to what we offer. At Gather, a revolving cast will provide workshops, creative play and outdoor activity in the day; films, live music, DJs and performers in the evenings. 8 course tasting feast celebrating the best of local produce from land and sea in the big barn at fforest farm. We have had the pleasure of hosting fforest feasts since 2016. Over a long weekend we welcome friends from far and wide to come and share good food and great company. A special evening centred on a unique dining experience. You can come for the feast only or stay and be looked after for the whole weekend at fforest farm. Book now for the fforest Winter feast below. fforest is an experience and a place that encourages engagement, collaboration and creativity. Whether it’s a workshop, a retreat, a conference or a reward for a hard-working team we have the space and facilities to cater for corporate events of varying sizes. We can organise activities and entertainment, if you need a helping hand. We’ll provide amazing food and the best little pub in Wales. From boutique to festival, we have a style to meet most alternative briefs. You may recognise our blankets & cushions when you stay with us, did you know you could take home your very own? We design our own blankets and cushions which are woven at a local woollen mill, enamel mugs in four colourways & featuring the fforest logo, woollen socks designed by us and made by Corgi, vintage rucksacks, aprons made from surplus tents & tarps, tea towels – lots of things to make your stay at fforest cosier. These can all be purchased at our fforest online shop so you can take a little bit of fforest home with you. 10 years of unique events in 200 acres of bliss. 3 days of woodland, fields, festival, fun, no boundaries. A blank canvas. fforest has hosted 150 weddings since 2008. Our venues have evolved as a celebration of the outdoors and an appreciation of the comfort offered by our indoor spaces. With the addition of the beautiful cedar barn and Ty Fforest farmhouse we are now able to host lavish weddings throughout the year, with guests staying on site and being treated to scrumptious fforest food throughout their stay. Inspiration, creativity & wellness. We have learnt that intimate retreats are full of the small things that can make a big difference. Our Glow Camps are either creative or active retreats with a common theme: to share, support & inspire each other. We have always promoted "Active Relaxation" - clearing your mind through the challenge of learning new skills and the physical demands of a tough day's play. We also understand the luxury of just doing nothing. Sit on the deck, watch the deer, read a book, or just dream. Glow camps are the perfect combination of the two - physical challenge interspersed with relaxation and comfort. We have hand-selected a few beauties from fforest general stores to help you with your gift-giving this Christmas. 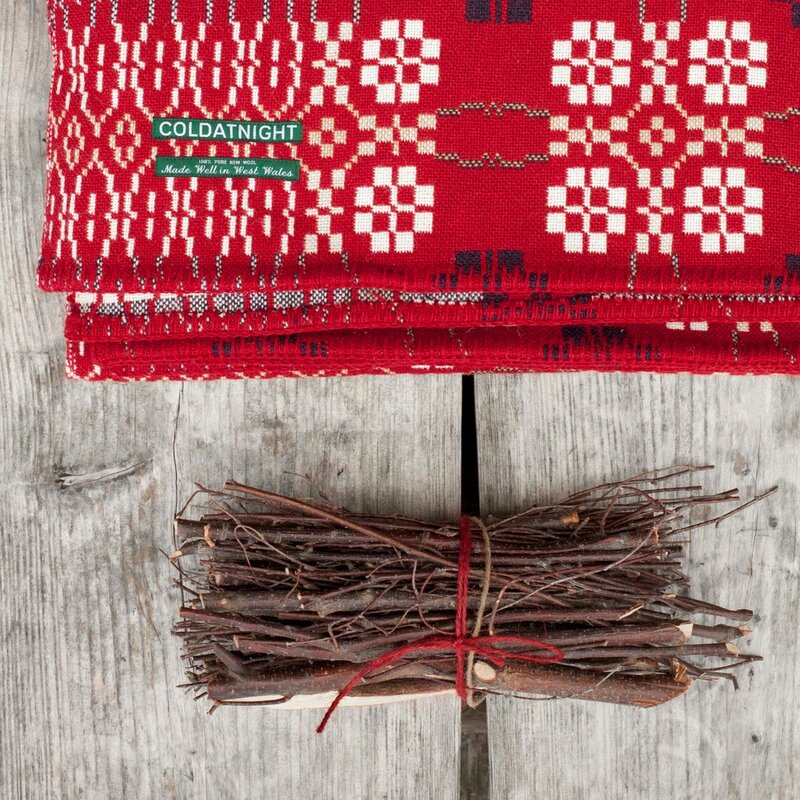 We have welsh textiles, kitchenware, homeware & fforest kid-ware in stock and ready for filling up those stockings! 100% wool and made very well at a small woollen mill near the banks of the Teifi, the same river that wraps around fforest farm. We have four beautiful colourways to choose from, blanket stitching all around the edges. You'll likely find fforest chief sporting one of these in the Winter months, he tries to mix up the colours daily. No, we're not talking about the fforest elves, its these beautiful welsh wool blanket hot water bottles. Perfect for cosy Winter nights. To keep and to treasure. Our blankets are a labour of love; made very well in a small woollen mill on the banks of the river Teifi, the same river that wraps around fforest farm. Choose from a selection of beautiful colours: Berry red, pebble grey & charcoal. You may have already guessed it, we do love our enamelware! Our fforest mugs have had a jazzy revamp and got all dressed up for Christmas. Available to preorder now. We swear by this Opinel knife. Slicing bread will never be the same again. Throw in a printed T-towel for good measure! A perfect gift for any cook. Peeling, paring and prepping vegetables is so much more enjoyable when using beautiful tools. Sets available in two colours. For all the young adventurers out there, we've put together this little bundle of explorer essentials. We have specially designed finger-friendly penknives for safe wood whittling & carving, a reindeer antler whistle for calling in the woods, and a cute hand powered penguin torch with ultra bright LED light and wrist strap, to help find your way in the dark. Kit them out and get them ready for the kitchen with fforest elf aprons. Available in navy and red. The ultimate Christmas socks! Designed by Sian and made in Wales by Corgi, who have been making socks since 1892! Stay tuned with this one, you won't want to miss out on these special beauties!